My mind and emotions are in the process of recharging. Keeping a low profile is the best I can do right now. and as a result I'm finding motivation harder to come by. Daydreams, however, those are plentiful! Tomorrow, on WW you will find a guest post from Cody! He will be sharing our newest green initiative. I love poetry and love your photo's. Keep your chin up. Spring Will come! The shot looks like nature offering a spoonful of sugar.....very sweet indeed. That, my friend, was my grandmother's favorite poem. Very fitting for your current mood. I'll be back to check out Cody's post. Ahhh... the bliss of solitude. Lovely picture. gorgeous shot to illustrate your mood. I know those days well. Love the pic... looks like a cold day! i almost used this very quote last night when I posted a photo of a daffodil plant. I know your heart will find pleasure soon. wish you a good year 2009, jessica! What a beautiful picture...so delicate! That was truly lovely. Thank you. Beautifully put........and the photo is divine! See you tomorrow! That is such a gorgeous shot, and the poetry fits perfectly. I know exactly how you feel! I am already tired of winter. January and February are SO hard. photo wow. Cody he also is coming out of is shell.ha ha ha .bring it on Cody. Yet, you manage to leave beautiful photos and poems every time! ahhh .. you were referring to the use of melancholy! curious what the green initiative is! 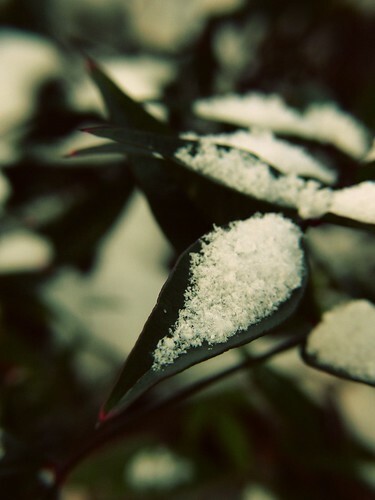 Your photo is so pretty with the snow on the leaf - it looks so peaceful. :) I had to learn that WW poem in 6th grade, and remember it to this day! BEAUTIFUL! Love the photo . . . and William always has the nicest turn of phrase. I think to some point we all feel like this, at this time of the year. We just need to recharge ourselves for the coming Spring! This is exactly how I feel at the moment ... melancholy. I don't know maybe the WINTER BLUES...but to read this, it is really a reminder of how I feel at the moment. You always have GREAT photography !! keep up the great work !. I'm in this boat ... I am waiting for WINTER to be DONE.